In 2015, I published a grand total of one blog post, embarrassingly titled “Resurrecting the Blog”. Oops. I’ll try to do better in 2016. I am Graalnak of the Vroon Empire, Destroyer of Galaxies, Supreme Overlord of the Planet Earth. Ask Me Anything. on Flash Fiction Online, April 2015. It’s pretty much what you’d expect from the title. In the End, You Get Clarity, in Unidentified Funny Objects 4, October 2015. This one’s a superhero origin story. Sort of. A Dozen Frogs, a Bakery, and a Thing That Didn’t Happen, in Daily Science Fiction, October 2015. A modern-day fairy tale. Also, my 2014 story Why I Hate Zombie Unicorns was podcast in audio on the Drabblecast in January 2015, and in October, I ranted about the Wizard of Oz as part of a group blog post about scary children’s movies. 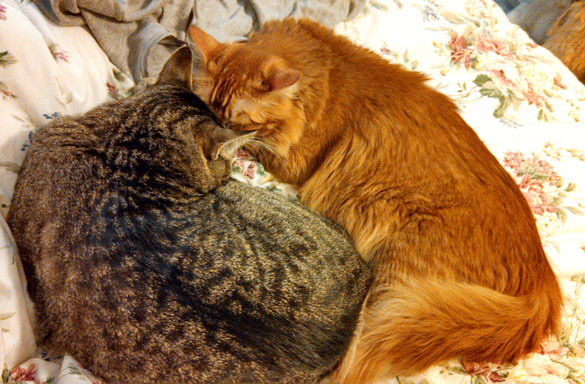 In other news, my cats continue to be adorable. Okay, technically this post isn’t about zombie unicorns or why I hate them. It’s about a short story I wrote called Why I Hate Zombie Unicorns, which you can read over at Shimmer. This is the first short story I’ve ever sold, and I’m pretty excited about it. The crowd at Mudville Field was full of hope that autumn day. They’d come out by the thousands just to see their home team play. And just about a million from the colony on Mars. To trade their strongest players to create one perfect team. Of crushing Earth’s most bitter rivals from Tau Ceti Four. Tau Ceti’s long-term strategy was not above reproach. Retiring on an income from an unnamed foreign source. Those who refused to quit would face some unexplained bad luck. A broken arm, a broken leg, run over by a truck. But after five or six most people thought it looked that way. But this time it seemed possible the team might just pull through. And here it was game seven, and the team was still alive. Out past the left field dolphin tank (a lush aquatic space). The Earth team’s land-based fans were the majority, of course. The humans and uplifted apes had all come out in force. The snackbots tossed bananas, peanuts, cotton candy too. Their throws were always graceful and their aim was always true. The beer drones fluttered overhead, all chrome and gleaming brass. They shot fluorescent liquids into every waiting glass. By inning nine, Tau Ceti was ahead with five to three. The Earth fans were about as tense as anyone could be. His swing was strong and certain and they said his heart was pure. But Casey couldn’t bat until four others had their turn. Joe Flynn was first and you could almost see his stomach churn. Emitted by the players perched upon Tau Ceti’s bench. The pitcher’s eyestalks locked in place and focused one by one. Her scales glowed green and purple in the bright midmorning sun. Her tail spikes flicked from left to right, so sharp and black and straight. Her talons grazed the ball as she propelled it towards the plate. Poor Flynn just stared at her, the way a mouse looks at a cat. He crouched inside the batter’s box and choked up on his bat. He focused on the ball and swung; he gave it his best try. Tau Ceti’s second baseman made quick work of his pop fly. Up next was Thayer, who had never stood out from the rest. He looked so grim and earnest as he faced his greatest test. He passed with flying colors — hit it right out of the park. The score was five to four and now the mood was much less dark. Then Sato’s turn came up. It didn’t last for very long. “Strike one, strike two, strike three” was Mister Sato’s sad swan song. Hernandez feared she’d strike out, end the game, and fall from grace. Instead she hit a triple and stood firmly at third base. When Casey made his entrance, he was such a welcome sight. The humans cheered; the dolphins jumped for joy and sheer delight. The snackbots threw confetti, and the beer drones poured free booze. With Casey batting for us, there was no way we could lose. The first pitch came, the first pitch went, and Casey let it go. The umpire called “strike one” and Casey shrugged and said “I know”. And Casey’s fans grew quiet as they willed him to pull through. Now, Casey hadn’t worried once, not since the game began. If you looked closely you might think he had a secret plan. He paused for one brief moment and stood still and calm and tall. And then he stepped up to the plate and waited for the ball. A swing that caused the game to end the way he knew it would. And left the field, defiant, with a flourish of his hat. The fans sat in the stands, just staring with their mouths agape. And though they all still try there is one fact they can’t escape. The umpire called “strike three.” The call was good, without a doubt. There is no joy in Mudville – mighty Casey has sold out. This probably reminds you of Casey at the Bat by Ernest Thayer. 1. On which website would you be most likely to find an ad for used kitty litter? Figure 1. What’s wrong with this picture? 2. Take a moment to examine Figure 1. What’s wrong with this picture? In description on the left, the apostrophe is missing from the word “World’s”. The standard list price for cat litter is, apparently, $96.85 for a 7-pound bag or $109.47 for a 14-pound bag. Used kitty litter costs more than new kitty litter. Used kitty litter is being offered for sale. 3. Every two weeks, Alice’s cats convert 25 pounds of new cat litter into used cat litter. If Alice pays $9.99 for each 25-pound tub of new cat litter and sells her used cat litter at market rates, how much profit will she make in a year? 4. Alice wants to quit her job and live off her cat litter profits. She currently has two cats; how many more will she need to adopt? 5. What should Alice call her online store? I have a terrible problem. My litter box is dirty and smells horrible and I don’t want to clean it. I am amazing at making pancakes however. I will trade my pancake skills for a clean litter box. Serious inquires only. 6. Essay question: describe the expected career path of the person who successfully completes this internship. 7. What’s unusual about this ad? It promises all-you-can-eat pancakes but doesn’t mention syrup. It doesn’t specify whether the pancakes must be consumed when the litter box is being scooped or whether the intern can show up at the employer’s home at any time and demand pancakes. It’s on craigslist, but it doesn’t say anything about the intern having to perform his or her duties naked. 8. What’s the probability that the person who placed the ad has at least one cat? Are what I see through. And don’t get the flu. 1. Sit in a comfy chair in a warm room with a cup of your favorite hot beverage. 2. Read the classic Jack London short story To Build a Fire, a harrowing account of a man and a dog struggling to survive in extreme cold weather. 3. Read Darla’s (She’s a Maineiac) Tales From the Ice Storm of 1998 (part 1 and part 2), a hilarious account of a woman and a cat struggling to survive in extreme cold weather.